Any artist who devotes their lives to pursuing their musical dreams has to be a bit of a risk taker. After all, it takes years of dedication and often putting off things like school, regular jobs, family, girlfriends, etc. in order to keep the eye on the prize. But for all the risk involved with this, it is nothing compared the high altitude risks that are the featured part of the new “Human Race” video from a French group that goes by the moniker Drunksouls. Don’t let the name fool you, even though they sound like they may be a sloppy mess, they are actually one of the tightest and most well put together reggae-rock bands on either side of the Atlantic. Their name is more of an indication of just how intoxicated they are with music and that it consumes their very existence. Their reggae and rock influences are very apparent, but they’re not afraid to turn heads with their unique grooves and overall free-spirited vibe. Their first LP, On Verra Plus Tard, was downloaded over 100,000 times by fans who bolstered the band’s popularity strictly through a word-of-mouth campaign. 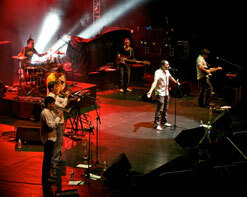 They’ve also taken their sound on the road with high profile performances across Europe. Their new album, Revolution, takes the band even further in their musical pursuits and it was the standout track “Human Race” that caught the eye, or should we say ear, of filmmaker Seb Montaz-Rosset while he was working on his documentary film, I Believe I Can Fly (Flight of the Frenchies). The film tells the story of a group of skyliners, which is a unique mix of high wire walking and skydiving and features some of the most breathtaking and heart stopping footage in the world. A long time fan of the band, Montaz-Rosset was eager to include the band’s music on the soundtack. He not only chose 4 songs fromRevolution, but also chose 4 from On Verra Plus Tard, making Drunksouls the standout music of the film. When Montaz-Rosset approached Drunksouls about including “Human Race” on the soundtrack of the movie, it was only natural to hatch the idea of using footage from the movie as a music video as well. Over 200,000 YouTube views later and the verdict is clear; this video rocks! Interspersing footage of the band performing at the legendary Grand Audiotorium at the Palais des Festivals de Cannes, it is an exhilarating ride as we see fearless arial acrobats performing stunts on wires strung between Parisian skyscrapers, towering cliffs across Europe and more. Sometimes they are tethered to the line and sometimes they are wearing nothing more than a parachute. If it weren’t for the soothing sounds of Drunksouls’ music throughout, there’s a good chance we wouldn’t be able to make it through this thrill ride without throwing our hands over our eyes in fear and amazement. Their freedom and love of life is infectious and is absolutely something that you and your viewers must sit back and enjoy! It’s our our personal thrill to have the opportunity to work with the Drunksouls to bring you this video. They’re a hard working and deserving band and we hope you’ll do your part to help break them here in the US with the new “Human Race” video. We’ve got plenty of copies of Revolution available so please don’t hesitate to be in touch. If you need more info you can contact us at (732)-613-1779 or email us at info@HIPVideoPromo.com . You can also visit www.Drunksouls.com or www.Facebook.com/DrunksoulsOfficial for more info on Drunksouls.